Avionics Mounts Inc. | MS28042-1, MS28042-1A, MS28042-2A, MS28042-3A, & MS28042-4A Clamp Sizes. 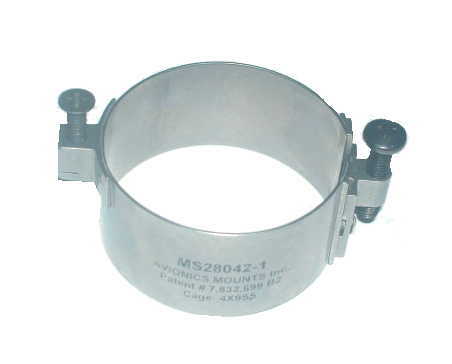 AMI Now offers the MS28042-1 Stainless Steel Clamp. AMI's new 3921021 clamp is designed to mount instruments recording flight safety information. AMI's new 3971030-3 clamp is designed to mount both the Bendix/King KI 525A instrument and the Bendix/King KNI582 Instruments in the Department of Homeland Security's Customs and Border Patrol helicopters. 64585 instrument mounting clamp equivalent. We first designed the 64485 for Hamilton Standard in the mid 80's. We sold that design in 2002. For a less expensive but stronger alternative, try our new design P/N 2111010. 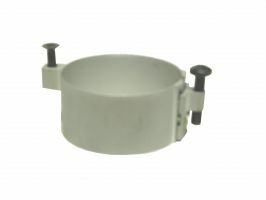 This is an this is a MS style clamp, for 1" round instruments that is 1 inch deep, with a anodized finish. It does not come with screws, and the mounting lug is not self-locking. We have been selling the MS28042-4A for over 70 years now. 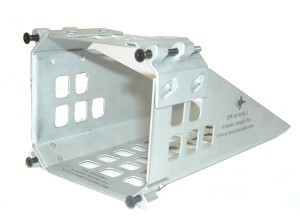 We have seen our designs of this clamp being used on hundreds of aircraft. 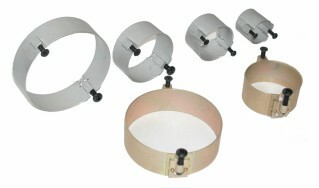 64540 instrument mounting clamp equivalent $23.58 each. We designed the 64540 clamp in the mid 60's for Lockheed. We sold that design in 2002. For a less expensive but stronger alternative, try our new design P/N 2112000. This is an MS style clamp, 1 inch deep, with a chem-filmed finish. 1: Anodized per MIL-A-8625, Type 2, Class 1, Clear. 2: Anodized per MIL-A-8625, Type 1, Class 1, Clear is no longer available. The parts are now anodized per MIL-A-8625, Type 2, Class 1, Clear. 3: Chem-filmed per MIL-DTL-5541, Class 1A, Yellow. 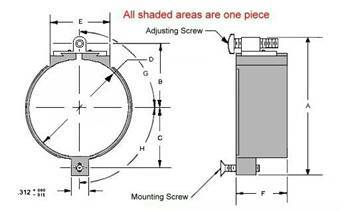 Recommended mounting and adjusting screw torque is 5-8 in. lb. All clamps are designed to meet the requirements of MIL-C-6818 and/or customer requirements. 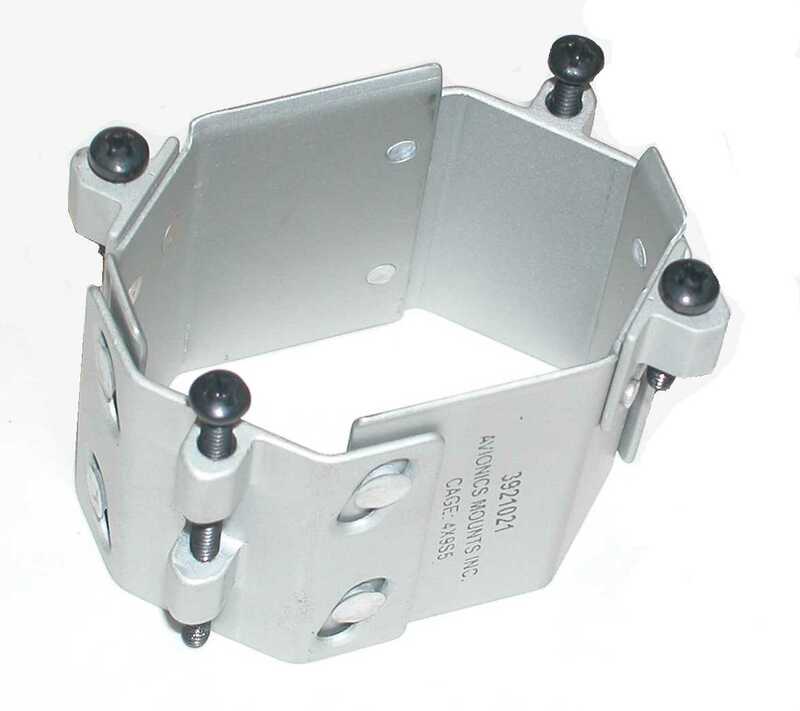 Band and closing bracket materials are 6061-T6 per QQ-A-200/8,  or AQMS-QQ-A-250/11. 6. The data in this column is intended to provide a potential cross reference to a competitive product. 64386 instrument mounting clamp equivalent. We designed the 64386 clamp in the mid 70's. We sold that design in 2002. For a less expensive but stronger alternative, try our new design P/N 2911005. This is an MS style clamp that mounts a 1.25 inch instrument, 1 inch deep, with an anodized finish. 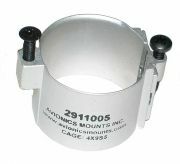 64544 instrument mounting clamp equivalent. We designed the 64544 clamp in the mid 60's for Lockheed. We sold that design in 2002. For a less expensive but stronger alternative, try our new design P/N 2412005. This is an MS style clamp to mount a 1.5 inch instrument, 1 inch deep, with a chem-filmed finish. 22: Anodized per MIL-A-8625, Type 1, Class 1, Clear is no longer available. The parts are now anodized per MIL-A-8625, Type 2, Class 1, Clear. 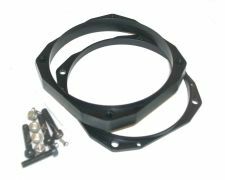 64613 & 64388 & 64388A instrument mounting clamp equivalent. We designed the 64613 clamp in the early 90's. We sold that design in 2002. Our new design incorporates all of the requirements of the 64613, 64388, and 64388A clamps into one design. For a less expensive but stronger alternative, try our new design P/N 2212000. This is an MS style clamp, 1 inch deep, with an chem-filmed finish. 64614 & 64389 & 64389A instrument mounting clamp equivalent. We designed the 64614 clamp in the early 90's. We sold that design in 2002. Our new design incorporates all of the requirements of the 64614, 64389, and 64389A clamps into one design. For a less expensive but stronger alternative, try our new design P/N 2212000. This is an MS style clamp, 1 inch deep, with an chem-filmed finish. 1. Recommended mounting and adjusting screw torque is 5-8 in. lb. 2. All clamps are designed to meet the requirements of MIL-C-6818 and/or customer requirements. 3. Bands are 304 S.S. and closing brackets are 303 S.S.
4. Threads in mounting lugs are self-locking. 5. The data in this column is intended to provide a potential cross reference to a competitive product. � Copyright 2009 - Avionics Mounts Inc.